Both the Stratford and the Shaw Festivals have produced hugely successful revivals of Noel Coward's scintillating 1930 comedy "Private Lives". 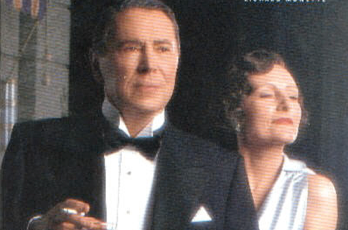 In 1978 Robin Phillips' production for Stratford starred Brian Bedford, Maggie Smith, Nicholas Pennell and Andrea Martin. In 1983 Denise Coffey's production for the Shaw starred Christopher Newton, Fiona Reid, Jim Mezon and Nicola Cavendish. While this, Stratford's second production, does not reach the same degree of perfection as either of the two mentioned, it is still highly enjoyable and should prove very popular. "Private Lives" is probably Coward's finest play. In its symmetry and it high ratio of wit per line, it is a worthy successor to Wilde's "The Importance of Being Earnest". We meet Elyot and Amanda Chase, who after a stormy marriage have been divorced for five years and have now remarried. As coincidence will have it, both couples have been given adjacent rooms with access to the same terrace in the same hotel in the south of France on the first night of their respective honeymoons. On meeting again, both Elyot and Amanda realize they are still in love and flee their new spouses, Sibyl and Victor, to seek refuge in Amanda's Paris flat. Confusion ensues. Beneath its glittering surface of epigrammatic wit the play is a satire on all forms of conventionality-of femininity (in Sibyl), masculinity (in Victor), marriage, religion, the integrity of the individual and even of death. As director, Brian Bedford is fully aware of these depths. He subtly brings these themes out through slight emphases or by slowing the pace without endangering the overall rhythm of the play. This is most noticeable in Act 2, when Bedford allows a mood of reflection to settle over the play-acting of Elyot and Amanda so that we see their apparent flippancy as a mode of thumbing their noses at the cruel joke time plays on us all. It is greatly to Bedford's credit that he makes us see so clearly the existential point to Coward's seeming frivolity. As an actor Bedford shows off yet again his impeccable sense of comic timing. Few actors at Stratford can accomplish so much with quick glance or a slight pause before a key word. The one worrying aspect of his performance is the self-congratulatory way he has taken to delivering his lines. This tends to remove the freshness from Coward's dialogue and with it its humour since one never feels that the actor has bothered to merge with his role. In fact, for much of the play Bedford speaks his lines directly to the audience rather than to the other actors as if he were a commentator on the action rather than a participant. This is, I suspect, one of the pitfalls of self-direction. Sparring with Bedford, Seana McKenna (Amanda) inevitably comes off second-best in timing. (Indeed, only Maggie Smith is his equal.) McKenna has a tendency, especially in Act 2, to begin every sentence on the same squeaky high note before descending into a normal tone of voice. This repeated pattern of intonation is distracting and lessens the impact of what she says. On the other hand, she makes Amanda a far more real character than Bedford does Elyot. While Bedford gives little sense of what Elyot is really like, other than beautiful speaker of clever lines, McKenna gives Amanda a more fully rounded personality showing that quirks and fears underlie her seeming triviality. Wayne Best and Sarah Dodd play the new spouses. Best is good at capturing Victor's bluster and self-satisfaction, but this one-note approach misses the point, stated outright in the text, that beneath all his pretense of manliness, Victor is actually a coward. Sarah Dodd, in her most important role yet at Stratford, is a thoroughly delightful Sibyl. With her spot-on timing, crisp delivery and adroit gestures, she may be the comic actress that Stratford has long been lacking. Kim Horsman, returning to Stratford after an absence of eleven years, makes memorable the small part of Louise, Amanda's grumbling, sneezing, French-speaking maid. John Lee Beatty's sets and Jane Greenwood's costumes are not consistent with the time of the action or the background of the characters. In Act 1 while Kevin Fraser's lighting conjures up a soft, moonlit evening, Beatty presents us with attractive rooms of a grand hotel on the Côte d'Azur and Greenwood clothes Amanda and Sibyl in appropriately light, flowing summer dresses. But by Act 2, set only "a few days later" according to the stage directions, Greenwood shifts forward two seasons to give Amanda an overdone winter-weight suit. Meanwhile, the flat Beatty gives her for Acts 2 and 3 is a Belle Époque mansard renovated to look more like an art deco bank vault than a private apartment and is filled with a miscellany of unattractive furniture. Beatty and Greenwood seem to think Amanda is guilty of the bad taste of a nouveau riche, contrary to any such indications in the text. One would think they could somehow have more appropriately reflected the elegance of Amanda's wit and person. All of the various difficulties I've mentioned in acting and design prevent this "Private Lives" from ranking with the best productions of the past. Yet, for most people these problems will not matter. In overall impact Bedford's taut direction, his insight into the text and the actors' clear, natural delivery of Coward's sparkling dialogue ultimately transcend these flaws to reveal how great a comedy "Private Lives" really is. Photo: Brian Bedford and Seana McKenna. ©2001 Stratford Festival.